This week we’re bringing out a new report that’s focusing on URLs, their performance and visibility, and that lets you work on a more granular level than before! It’s something you have been specifically requesting from AWR during these past few months since we’ve been remaking the app, and we’re super happy to now present it to you. The latest AWR update comes with URL rankings, new visibility and Search Console metrics for each URL and plenty more. Lots of new data to play with and cool ways to do so. I’m sure this sounds exciting, so please bear with me through the next couple of pages. I’ll walk you through everything that’s been added and show you how to start putting all this new info to good use. If you’re new to AWR this is a great time to start a free 30 days trial and see how this works for your own business. 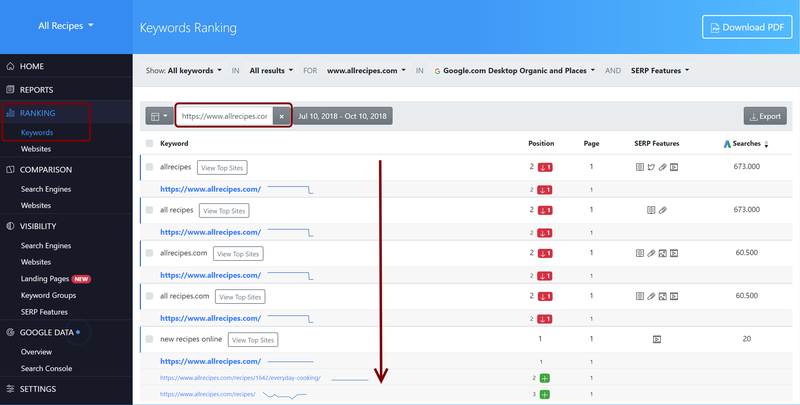 Pretty much similar with how all the other AWR reports are structured, this new Landing Pages Visibility revolves around the list of site URLs AWR found ranking for the keywords you’re focusing on, together with URL specific performance metrics from various sources. But let’s see how exactly this report works and how it ties in together with the rest of the data you have in your AWR projects. Seconds after you’ve accessed the new report, your sight will be drawn by the individual progress charts each URL has next to it. There’s nothing that says progress better than a chart line going up, right?! The chart lines visible next to each URL show the evolution of their Visibility Percent, the most comprehensive metric for determining performance in SERPs. So, just by browsing through the report, you’ll rapidly spot any URLs that are losing ground in SERPs. Next of, you’ll want to start looking more closely and analyze more of the data this report brings. As most reports in AWR, Landing Pages Visibility gathers metrics from various sources, and while only a few are visible by default, you can always find the complete list in the top-left column selector drop-down and choose whatever is relevant to you at the moment. The default metric combination we chose for this report focuses on ranking performance of site pages: the number of Keywords ranked, the Highest Rank each page has at the selected date and their Visibility Percent. Or you can set the report to focus on traffic performance of site pages. You’ll see in an instant how each URL performs in SERPs, how many Impressions it gets, how these translate into actual site visits and further on, find out if this website traffic sticks and turns into more than one page view. As a reminder, before configuring this report, please be sure to have your GA and GSC accounts synced with AWR, so that the specific data is fed and you can draw complete insights. In AWR’s Landing Pages Visibility report, the Sessions column expresses the total number of website visits that start with the corresponding Landing Page, while PageViews shows the total number of pages viewed during the sessions that started with this page. Tip: When evaluating traffic performance of pages, I also like to throw in the report the Estimated Visits metric, that tells me if the number of Sessions my page is getting is anywhere near the amount of organic traffic it would normally get from its keyword rankings, or more work is required there. Average Rank, Visibility%, Impressions and Sessions work great together for a performance overview for your pages, from ranking in SERP to attracting organic traffic. I love this metric combination because it paints the full picture. You can see how well your pages are ranking for the keywords targeted, how many people search for these keywords and actually get to see your site listed in SERPs, and finally if they click your URLs and land on your website. Tip: Avg. Position metric from Search Console and Average Rank calculated by AWR, are essentially showing the same thing: average value of your keyword rankings. However, their values will, most often, differ, since the keyword set and search markets tracked in AWR are not the same with those reported in Search Console. Moreover, the filtering options you’re accustomed with from using AWR are also available for this new report, enabling you to narrow your URL analysis down to your best performing pages (First place, Top3), your least performing ones (Top 30, Dropped URLs) or those in need of just a push to advance on to the first page (Top 20). 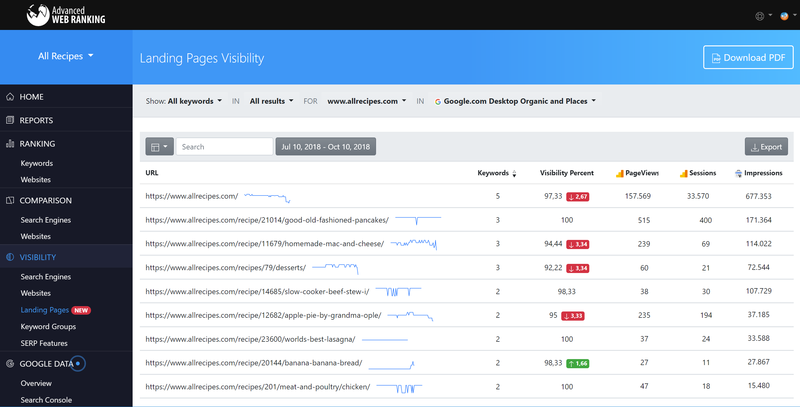 With these new capabilities the Landing Pages Visibility reports brings, identifying and managing cannibalization cases becomes a lot easier. Start by sorting the Landing Pages Visibility report by number of ranked keywords, to highlight those pages that rank for a wide range of terms. The chances are some of these keywords are not too relevant for these pages and the pages that would be indeed more suited for them are getting cannibalized. Then go ahead and click the number listed on the Keywords column to see the actual keywords your page ranks for. Here you can both check on keyword relevancy for your main page, see ranking evolution charts and spot if there are any other pages that also rank for the same set of terms. A keyword with good search volume, good ranking and consequently a good organic CTR that has all the premises for driving consistent traffic to your page, is a good keyword. But which one is the best? The most effective at this moment? When you’re constantly aware of which is the best performing keyword for each page, you get clarity and can coordonate your keyword strategy easier and faster. With this new update, AWR now shows you, for each URL, its top keyword, based on its estimated ability to drive traffic to the page. Tip: Once you click the [keywords] link, it gets you to the list of ranked keywords, where you can get an overview of the URL’s entire set of targeted keywords, and their performance. Make sure the Search Volume column is added and sorted descending, so that the keywords with the most monthly searches stand out, and then correlate them with their ranking. You may find that your top keyword, with the best traffic potential, is not the one with the highest search volume. Another thing you probably noticed right from the start, is the color coding some URLs have in the Landing Pages Visibility report. These are the URLs that have started ranking in the time interval you have selected for your report (colored in green) and those that lost their rankings completely during the same period of time (colored in red). Having these types of entries in your report is nothing to worry about, unless you start seeing volumes. At that point, something may be fishy and needs investigating. There are two Display modes available in AWR that you can now use. These will help you look for patterns and causes of any bulk URL ranking drops/increases – “New URLs” and “Dropped URLs”. 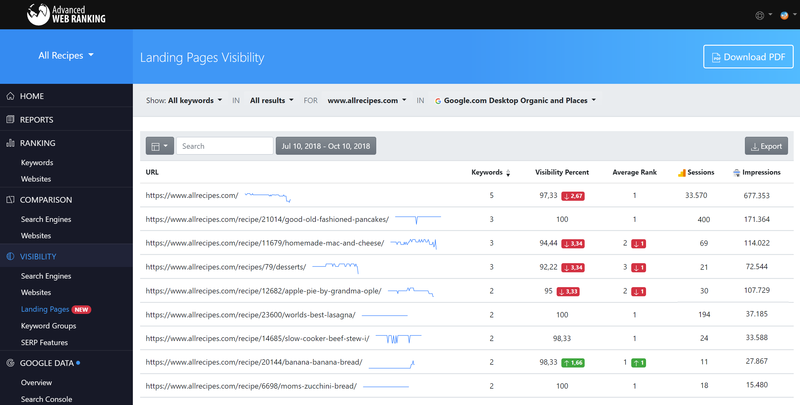 For the Visibility reports Search Engines, Websites and Keyword Groups this AWR update brings a quite important improvement. We’re now able to compute Ranking Comparison metrics, or otherwise said, the changes in Visibility metrics, across any period of time. Let’s say you have a project updated on a weekly frequency. However, the reports are sent out to clients once a month. In this case, the ranking comparison metrics will show you the change between the first update and last update of the report time frame, while the chart will help you track the progress of these changes for consecutive updates. This means that you will now be able to include the position gains or loses in reports, for any period of time, regardless of number of ranking updates performed or the project’s update frequency. Hope you’ve enjoyed this walkthrough on the latest AWR updates. Please be sure to let me (or my colleagues from support) know your thoughts, questions and feedback. And I’ll see you soon with more updates! Kudos for writing great post. Awesome tool to see landing pages visibility, much required when you are working really hard for SEO. Awesome tool to see landing pages visibility, much required when you are working really hard for SEO. Wow your tools looks great. I’m using Ahrefs but your google sudden rank dropping shift looks cool. Great tool for landing pages visibility, Appreciate it. Awesome tool to see landing pages visibility! Great content too. A landing page is a great way to drive traffic, improve your SEO and build your brand, lead customers to a specific product, service or offer and encourage them to take action. Great tool to see landing page visibility and drive traffic to build brand.